Jane Fryers is a couture milliner with a love of the unusual. Jane studied millinery at The London College of Fashion and then with Rose Cory, the late Queen Mother's milliner. In 2004 she was a finalist in the HAT Magazine's Designer of the Year Competition. 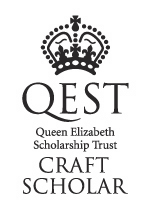 Then in 2005 Jane won a scholarship from the Queen Elizabeth Scholarship Trust (QEST). This enabled her to take a series of intensive courses on traditional millinery skills at Kensington and Chelsea College and continue her studies with Rose Cory. Since winning her scholarship Jane has been awarded first prize in the Italian Cappelli nel Mondo and second prize in the Feltmakers Design Competition. Both pieces were part of her Rechauffe Collection - making hats from recycled materials. Jane has exhibited at Avec, The London Hat Show at the Meunier Gallery, The SaLon Gallery Art Fair in West London, Hat Works in Stockport, Mosimann's Private Dining Rooms, the Blue Hat Exhibition in Sydney and PrinjsesHatwalk in The Netherlands. One of Jane's favourite materials is fish leather and some of her designs were on sale at Fortnum and Mason when HM Queen Elizabeth, and the Duchesses of Cornwall and Cambridge visited during the Diamond Jubilee Year. Her Majesty was interested to know whether fish leather smelled fishy and Jane was happy to enlighten her. It doesn't!! 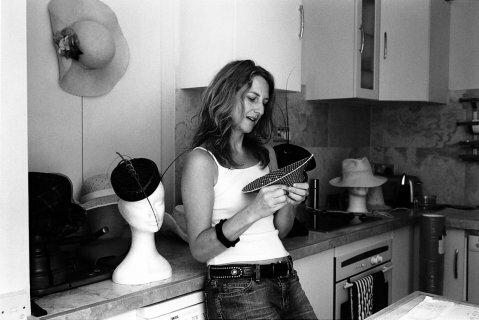 Having discovered a passion for passing on her knowledge and inspiring new milliners, Jane can also be found teaching at Central Saint Martin's College and at Atelier Millinery in London.